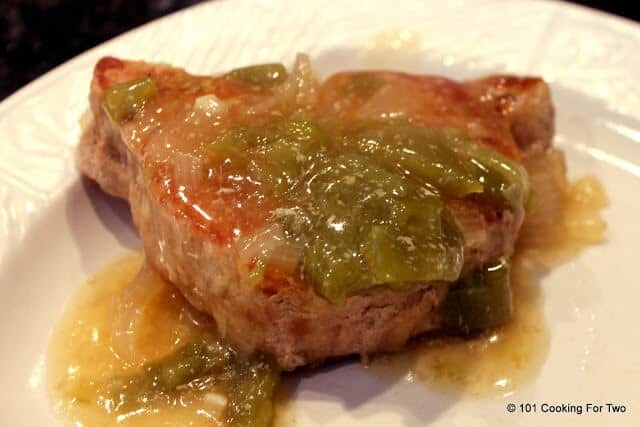 Fall apart tender pork chops covered with gravy. It makes your mouth water. All in an easy slow cooker recipe. I started with a whole pork loin. Trim the fat cap for health and cut into 1-inch slices. Add a nice brown in a pan before loading them into a crock pot with onion, green pepper, and garlic. Add some broth for moisture and cook until fall apart tender. Then make a simple gravy with the liquid. A nice medium 4. This is an easy cook that will be hard not to like. Notes: I always use thick slices of pork loin for my “pork chops”. 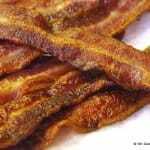 It is easy to remove the fat and make them reasonably healthy. 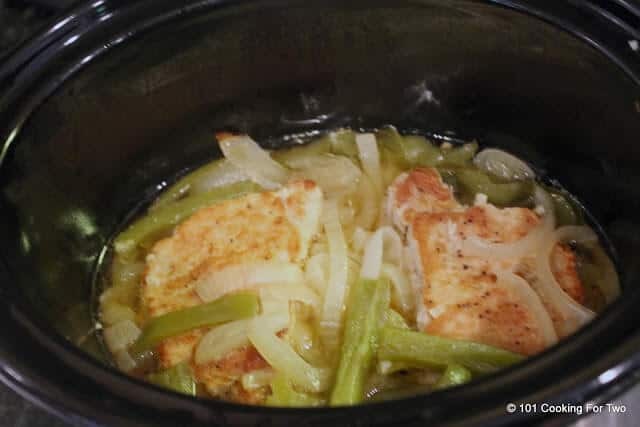 Of course easy to double or triple in a larger slow cooker. 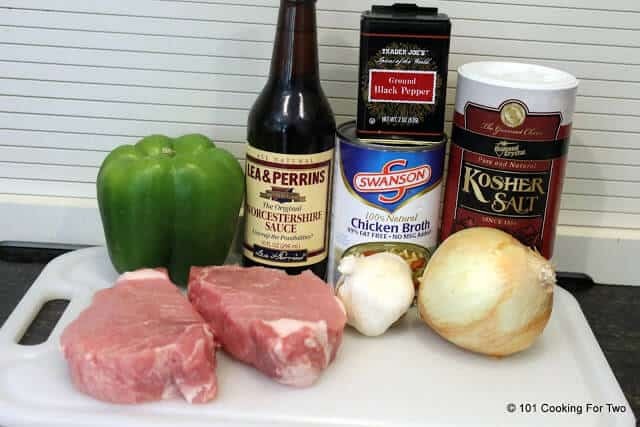 Start a couple of 1-inch pork chops. I’m using trimmed slices of pork loin. Salt and pepper to taste. Heat one t oil over medium-high heat. 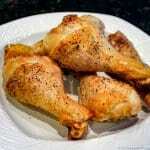 When hot, add the chops and brown each side for 3-4 minutes to get the color you like and add some taste. 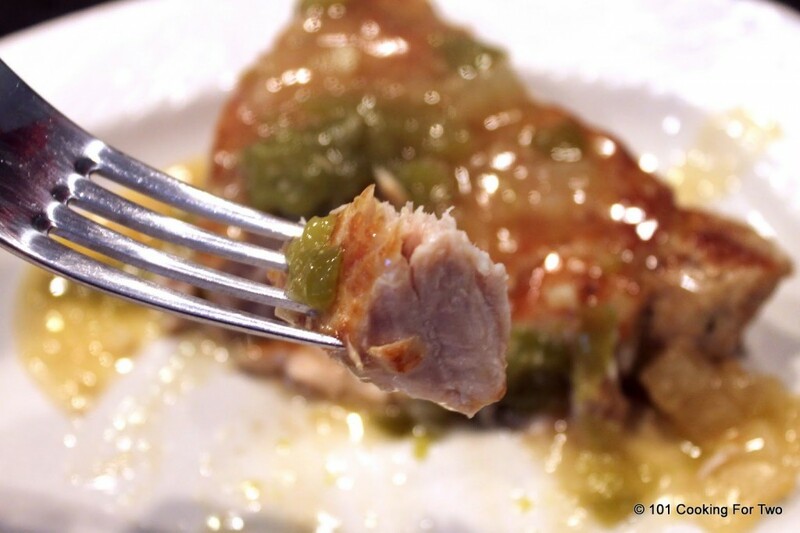 While pork is browning, slice one medium onion and one green pepper. Also, crush two cloves of garlic. Add half the veggies and garlic to the bottom of a small crock pot. I used a 3 1/2 quart. Add the pork on top, add the remaining of the veggies and garlic. Add 1 cup of chicken broth and 1/2 t Worcestershire sauce. Cook on high for 2 1/2 to 3 hours or double that on low. 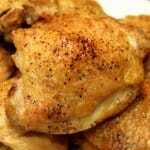 For gravy, mix four tablespoons of cornstarch or twice as much flour in 1 cup of cold water. Move the chops to a plate and pour the liquid in a pan over medium-high heat and bring to a light boil. Slowly pour in the thickening liquid while stirring vigorously until starting to thicken. At that point, stop adding the thickener and continue to stir and simmer for a few minutes until gravy is done. Add salt and pepper to taste. 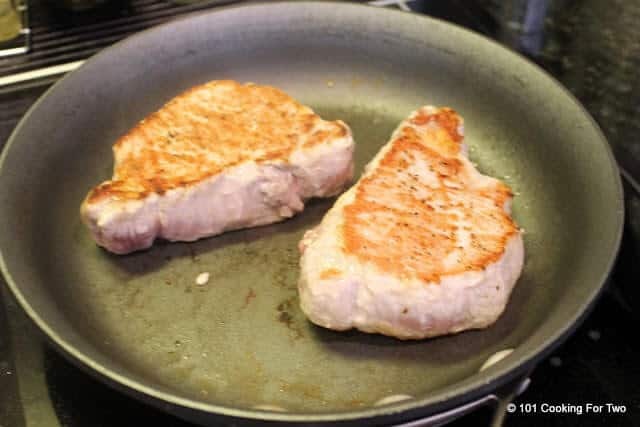 Start a couple of 1-inch pork chops. I'm using trimmed slices of pork loin. Salt and pepper to taste. 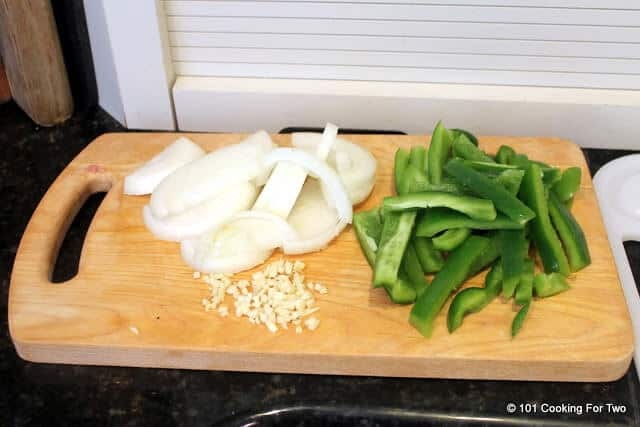 While pork is browning, slice one medium onion and one green pepper. Also, mince or crush two cloves of garlic. 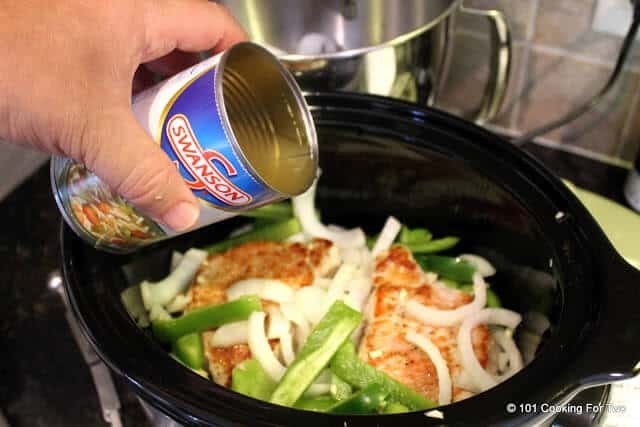 Add half the veggies and garlic to the bottom of a small crock pot (This is a 3 1/2 quart). Add the pork on top, add the remaining of the veggies and garlic. Add 1 cup of chicken broth and 1/2 t Worcestershire sauce. For gravy, mix 4 tablespoons of cornstarch or twice as much flour in 1 cup of cold water. Move the chops to a plate and pour the liquid in a pan over medium-high heat and bring to a light boil. Slowly pour in the thickening liquid while stirring vigorously until starting to thicken. 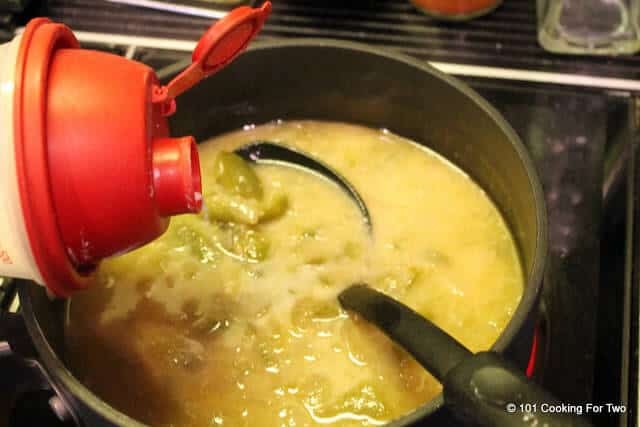 At that point, stop adding the thickener and continue to stir and simmer for a few minutes until gravy is done. Add salt and pepper to taste. Looks delicious! But is the “t” for the worschestire sauce tablespoons or teaspoons? Big T is tablespoons and little t is teaspoon. Old notation… I’m in the middle of a total blog rewrite and this one has not been updated yet. 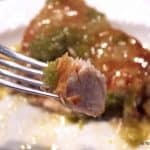 My favorite pork chop recipe is https://www.101cookingfortwo.com/30-minute-fried-pork-chops-with-gravy/ so you might want to check that out. I could dive right into that plate o’ pork!